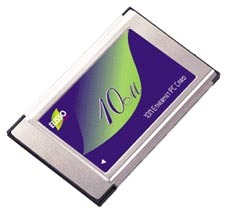 The UPE4010 PCMCIA 10Mbps Ethernet Card is a credit-card-size Type II PCMCIA Ethernet adapter that complies with the PCMCIA 2.1 and IEEE 802.3 standards. It works with computers that incorporate a compatible interface. The drivers associated with this card allow you to use the most popular Network Operating Systems (NOS) in the PC environment very easily. There are two kinds of media coupler may be used for network connection. For UPE4010-TC, a media coupler with RJ-45 socket and BNC connector is used to hook up to 10Base-T twisted-pair network or 10Base2 coaxial cable network.For UPE4010-T, a media coupler with RJ-45 socket is used for twisted-pair network only. The UPE4010 PCMCIA 10Mbps Ethernet Card is switchless and software configurable. An enabler program can successfully drive the card. Even without the card and socket service drivers for PCMCIA controller installed, you will still be able to use the card by running the enabler program.